Dating is a common thing now. Being in a relationship, having a boyfriend/girlfriend is no less than a trend for school and college students. The ones who don’t find someone special try to search for their soulmates on online dating websites. Such sites help introvert people to express their feelings by texting. They are useful for individuals who are not socially active but still want to experience the joy of having someone special in their lives. There are many such sites and apps. It’s a bit risky to trust someone completely on such sites, but who says people always trustworthy otherwise. There is always some risk involved and taking up the risk is sometimes all that we need. While some just want a timepass relationship, many people want marriage. It’s a wonderful feeling when you marry the love of your life. It feels great to have someone to support you all the time finally. Someone who becomes family even after being out of the family. It’s very hard to build such a foundation, but it’s never impossible. So, in this hope only, people register on various dating sites. One of the most famous ones is eHarmony.com. This website was launched in 2000 in the United States. It is an LA Based company. Dr. Neil Clark Warren founded it. He realized the marriages that are most successful are because of Compatibility and not anything else. So, he is trying to make most compatible singles meet and give them a wonderful married life that they deserve. It’s not about luck and destiny always. In fact, compatible couples love together longer than the ones who say that they are very much in love with each other. When we talk about this website, it’s the most successful and trusted site. Many people have found their love on this site and are triumphal with their respective compatible partners. It’s like a cupid or angel for many individuals in search of their love. Fill the form that’s available. Agree with all the terms and conditions. You are ready to go. Next time you can login using this id. These plans are different and have a different fee structure. Even though, this website is very useful and trustworthy; people do decide to leave it. 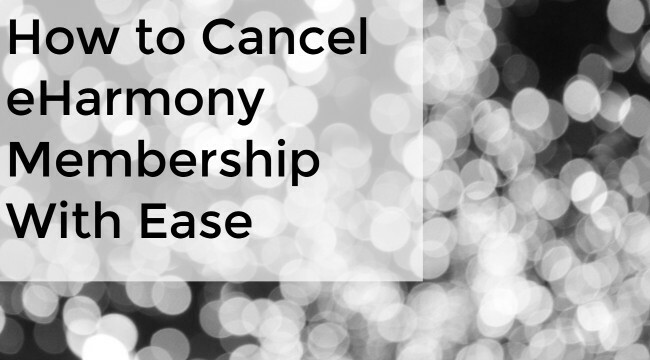 So, when you need to do that, you should know how to cancel the eharmony membership. It’s very easy and straightforward. Not much of efforts are required for that. And you know you can subscribe again if you want. Choose 'Cancel my Subscription' and follow the further instructions given. You can demand a refund if you are at a very early stage of your subscription. I hope these steps and ideas will help you.